This thatched building was on the site of the new Library and faced Lisburn’s Linen Hall where the Post Office now stands. Coulson’s closed in the 1950s after almost 200 years of continuous production in these premises. William Coulson (1739-1801) set up a damask linen weaving company in Lisburn in 1764. His hand woven linen tablecloths and napkins became renowned for their high quality and elaborately woven patterns. They were commissioned by royal and noble families throughout the British isles and Europe. William Coulson had four sons, John, William, Walter and James, who continued the business after their father’s death. During the 1830s the company split in two, when James set up his own firm, James Coulson & Company. Both firms continued to produce damask and other fine linens for royalty and other international and prestigious clients until the 20th century. 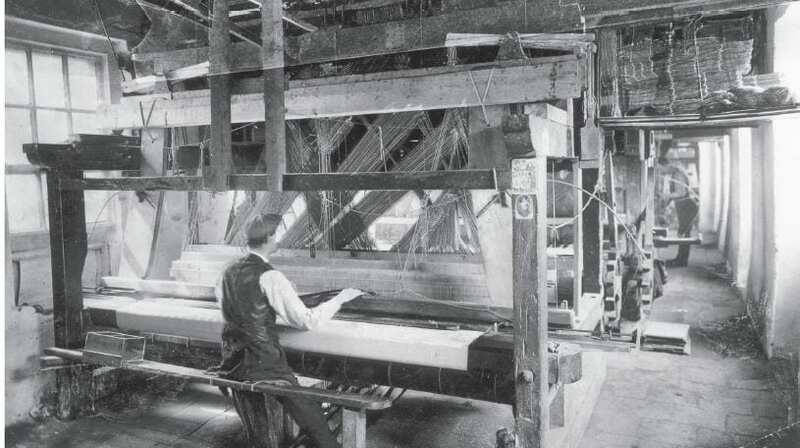 A Jacquard hand loom damask weaver at work in Coulson’s, c. 1900. The workshops were long and narrow with width only for a single loom and a connecting passage way.